I couldn’t resist pausing for a moment to take this picture. 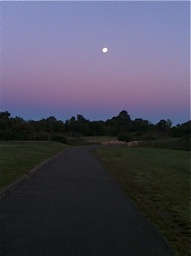 The moonrise and the surrounding colors were amazing. Sometimes playing golf affords us the opportunity to see things we may have missed otherwise. Whether we have good shots or bad, seeing this makes playing the game worth while! This entry was posted in Articles and tagged cathy macpherson, Golf Course, Golf Instruction, LPGA, Moon Rise, Teaching Professional, Top 50 Teacher. Bookmark the permalink.